Fishing the deep blue waters of the gulf stream is an awsome experiance! 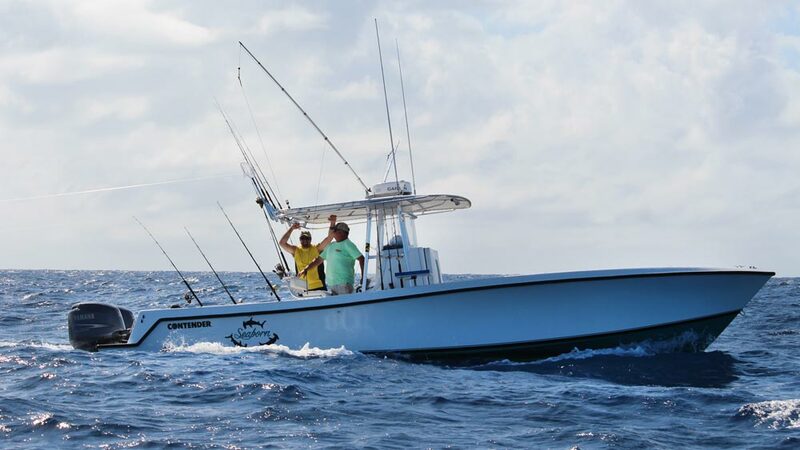 You’re fishing for mahi mahi wahoo, tuna, a variety of billfish – including blue and white marlin, sailfish ,spearfish and swordfish. You may also encounter large pods of spotted, spinner or bottle nose dolphins, huge leatherback turtles and the occasional pilot or sperm whale. Let me tell you, there is nothing like watching a mahi mahi or a billfish jumping clear out of the water at high speeds, or a wahoo taking line at 65 mph! All billfish are catch and release with mahi tuna and wahoo being excellant table fare. Captain Jason will point you in the right direction to have your fish prepared at our local restaurants. 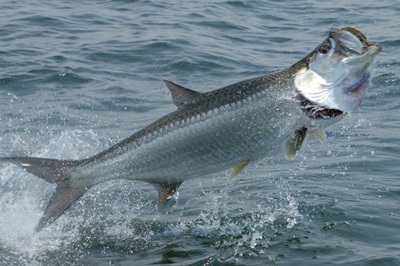 Tarpon fishing in Key West is some of the most exciting fishing you can do! The tarpon or “silverking” is a very fast high endurance fish that jumps alot and is known for cutting lines and breaking hooks. These fish average anywhere from 40-150 lbs with whoppers up to 200 always a possibility. Captaion Jason is an expert at finding and catching these fish all around Key West, knowing which tide and spots are producing the best. Chumming with mahara or herring is the most common method, but we use live bait, plugs and even fly gear. Snapper, cobia, grouper, mackeral and barracuda are also common catches while targeting tarpon. Fishing the gulf is fishing around wrecks, rockpiles, jettys or any other structure. The gulf hosts a wide variety of species. 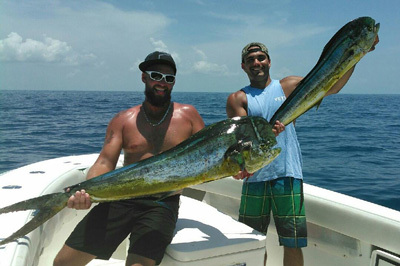 You can catch Goliath grouper,sharks of all sizes, cobia, king mackeral, permit, barracuda. We anchor over the structure and chum for the fish. 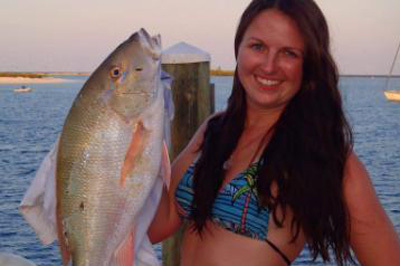 Mangrove, lane, mutton and yellowtail snapper are a sure bet. Having the ability to fish either the gulf or Atlantic assure a calm water trip whatever the wind is. Patch reefs are small patches of coral heads that dot the ocean floor of the 5 miles between Key West and the Barrier Reef. 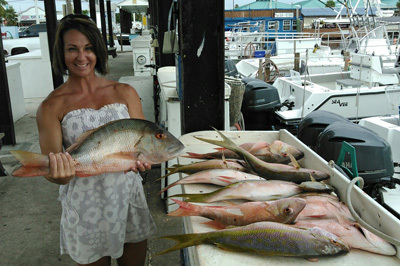 Lots of yellowtail, mangrove, mutton, lane snappers, porgies, grunts, black and red grouper are all fantastic dinner fish. 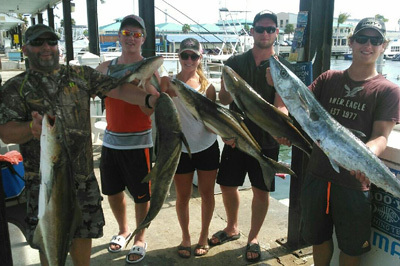 You can also catch cero, Spanish and king mackeral, cobia, barracda (some are trophy size! ), jack crevalle and sharks of all sizes. This is a calmer water, high action trip — great for anglers that like constant action with a good chance at a big one! Fishing the deep wrecks of the Atlantic can be an arm stretching good time! The wrecks we fish are anywhere from 80 to 310 feet deep, using live bait as the primary method and sometimes jigging. We either drift or anchor over the structure, depending on the conditions. Generally we move from wreck to wreck (most are close together), but as much as Captain Jason fishes he knows which ones are working. 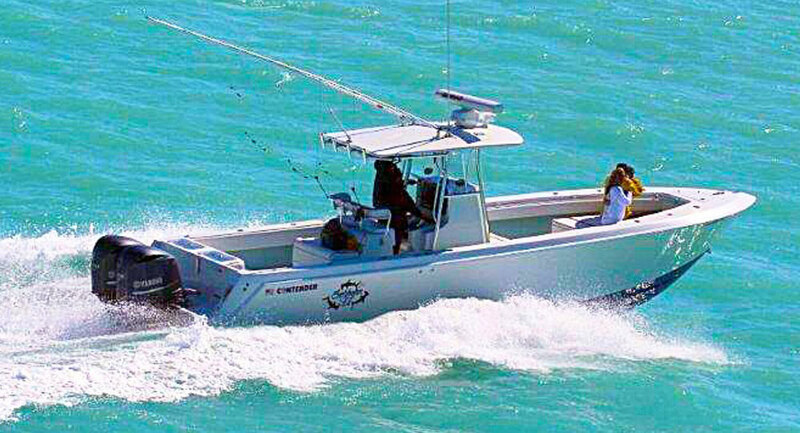 Anticipated catch includes a wide variety of fish including greater amberjack, large black grouper, barracuda, goliath grouper, African pompano and the always present shark. Usually big bulls, greater hammerheads and Caribbean reef sharks are the most common. However, you never know when that giant mako or dusky will swim up – so we are always ready. These are mostly large fish, so rest up for this trip! The Florida Keys Barrier Beef Tract is the only living coral reef system in the U.S. and stretches from Key Largo to the Dry Tortugas, about 60 miles past Key West. It is home to thousands of species of marine life. 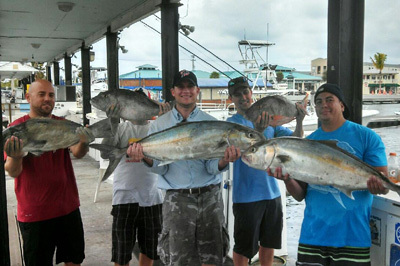 Knowing which reef or reefs to fish is one of Captain Jason’s specialties. The main targets are large “flag” yellowtail snappers, mutton and grey snappers, big red and black grouper, other fish, mackerel, jacks, bonito – the always present sharks are common. The sharks are big, bull, hammerhead, lemon, tiger, blacktip and nurse sharks. They can reach up to 500 lbs.! This is a high action trip for dinner species as well as trophy caliber fish. Captain Jason will give you a quick how-to lesson and then its all you! All advise is given in a good mannered way. You’re here to have a good time — no yelling or stuff like that with Captain Jason! Just good fun for all. 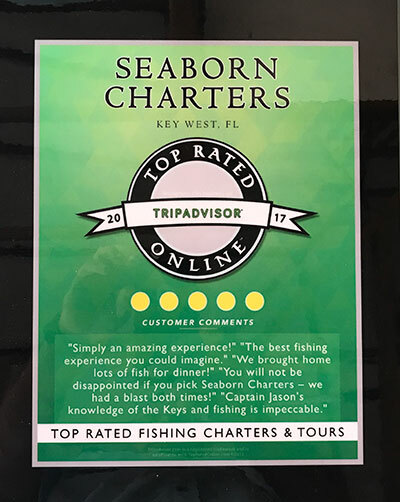 Captain Jason has been catching sharks in the Key West waters for over 30 years. 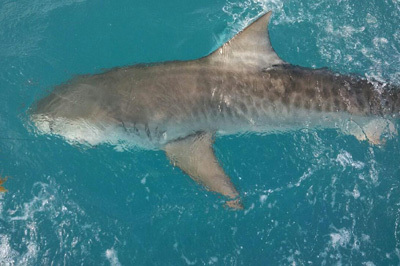 Sharks can be caught in all depths and in all areas of Key West and the Florida keys. For some species we use 20 or 30 lb. spinning gear, and others may need 50 or 80 lb. gear to get em in. We catch lemon, hammerhead, blacktips, nurse and bull sharks in the back country (always calm), fishing channels that are carved through the flats. Watching a 200 lb. shark race across the flats in less than 2 ft. of water really gets your heart pumping! 20 or 30 lb. spinning gear is used in the back country, meaning Captain Jason will sometimes have to break anchor to chase your fish down. Very exciting! When moving out to the reef or deep wrecks and into the deep blue we use mostly 50 or 80 lb. gear for the monsters, sometimes fighting these bad boys for an hour or more. Giant hammerheads, monster bulls, world record size Caribbean reef, huge lemons (up to 10 ft.) and big tiger sharks are common. These sharks are at the top of the food chain and are very tough! It’s not uncommon for anglers to switch off fighting one of these monster fish. Captain Jason is a member of the N.O.A.A. shark tagging program, so getting “your” name on a shark is always possible. Good luck!